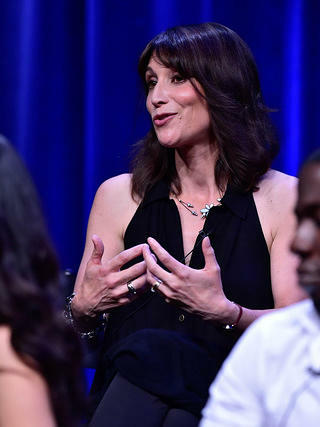 After years of early American history documentary and filmmaking, producer and filmmaker Lisa Wolfinger decided to turn her focus and research toward the Civil War as its 150th anniversary was fast approaching. On January 17, 2016, five years after Wolfinger’s research began, “Mercy Street” premiered as PBS’ first original drama in over a decade. Following the lives of two volunteer nurses from opposing sides of the war, “Mercy Street” features a lineup of actors including Josh Radnor, Mary Elizabeth Winstead, and AnnaSophia Robb with executive producer Ridley Scott (director of “The Martian”). We got the chance to catch up with Wolfinger about her experience researching and filming in Virginia, as well as about what will make “Mercy Street” so special. What attracted you most to the story of Mansion House? As I did my research, I realized that the medical side of the Civil War had never been told. It was really fascinating and filled with colorful characters, and of course the doctors and volunteer nurses were in many ways the unsung heroes of the Civil War. So initially I was drawn to Mansion House, a general hospital, but when I realized that it had once been the grand luxury hotel in Alexandria and the family who owned the hotel, the Greens, actually lived in Alexandria through the Civil War—[that they] didn’t leave with all their neighbors—I realized that we had something quite special there. Yes, we had the general hospital setting, but we also had a link to a Southern family saga. You spent a fair amount of time in Alexandria researching for the show; why was this so important to you? I’m a historian by training. I think I have that historian’s discipline, wanting to do the research as thoroughly as possible, wanting to understand a time and a place as thoroughly as possible, and for me that includes all the details that go into making a world authentic. I think a lot of people enjoy English costume dramas because the English do such a good job of creating authentic period worlds. So that was my goal with this drama, to find the authenticity, to create a world that felt real. 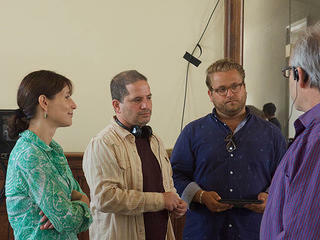 Lisa Wolfinger on set with executive producer and co-creator David Zabel. 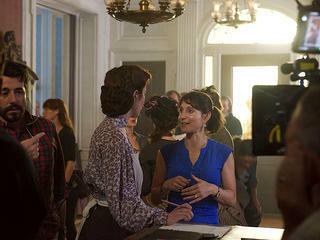 Lisa Wolfinger talks with Mary Elizabeth Winstead, who plays Mary Phinney, on set. Unfortunately there are so many towns nowadays that have lost their architecture, have lost their historic buildings, have lost their character. As a storyteller wanting to do the research into a period story, if you walk through a strip mall, you’re not going to get anything back—it’s not going to tell you anything about the world that existed there 150 years ago because it’s been covered over. [But] in Alexandria it’s beautifully preserved; it truly is like walking back in time. And yes, there’s nothing more important for a storyteller, whether a filmmaker, or a novelist, or a historian, to walk into a building that can transport you 150 years, 250 years, back in time. To walk down a street that can transport you several centuries back in time, it’s like nothing else. I think as a storyteller you need that sensory experience—you need that visual experience—to be able to recreate it in some way and to make that feel authentic. Why couldn’t “Mercy Street” be filmed in Old Town Alexandria? It would have been fantastic to film in Alexandria, but there were many reasons why it just wouldn’t make sense: it’s a very busy town and ideally for filming purposes you want a location you can shut down and takeover. But I knew I wanted to shoot in Virginia so one of the things I did early on was go looking for locations that would work for us. I really didn’t want to build sets; I wanted to find practical locations. I think one of the things that makes "Downton Abbey" so special is Highclere Castle; it’s an actual place, and you get so much detail because you're filming in an actual place and I think there’s a history to Highclere Castle that you just feel as you’re watching the show and it helps create a very authentic world. I wanted that for this series. For the Green home we ended up shooting at Centre Hill Mansion in Petersburg, Virginia. It actually has a Civil War history; it was built in 1823 by Robert Bolling and I would say it is a combination of Federal, Greek Revival and Colonial architectural styles. It has its own rich history; two U.S. presidents visited the home: Abraham Lincoln and William Howard Taft. After the fall of Petersburg, the mansion was used as headquarters for the Union army and so even though it doesn’t look like Carlyle House, it had the stature and it had the space that we needed. We shot our hospital interiors at Laburnum House in Richmond. It’s a Neoclassical Revival; the architectural style worked and again it gave us the scale that we needed because for a building to work as a luxury hotel that has been turned into a hospital. We needed a lot of space, we needed big rooms for the wards, and we needed different kinds of staircases: a grand staircase, a servant’s staircase. We needed multiple floors. When I scouted it four years ago it had been on the market for many, many, many years and it was slowly falling apart. So I think everybody is very excited that we picked that house to shoot in. We’re hoping we will bring some attention to it. Lisa Wolfinger discusses "Mercy Street." 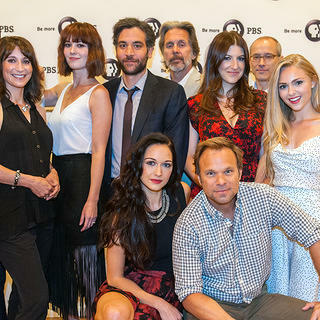 You and the cast got to premiere the show in Alexandria last fall. What was it like to see the cast visiting the locations where this all really unfolded? I think different cast members had different experiences. Scotty Caldwell (L. Scott Caldwell) who plays Belinda, who is the Greens' house servant, spent some time in Alexandria with Audrey Davis at the Black History Museum. 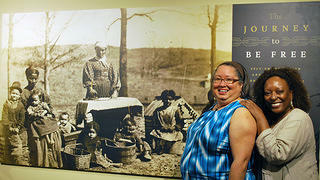 She wanted to get a sense of the African-American experience in Alexandria 150 years ago. I think the hard thing for her is there is so little left of that history to see and that is a tragedy. But I know Audrey is working hard to reverse that. Hannah James is from Virginia, but clearly had not spent a lot of time in Alexandria. For her, having inhabited the character of Emma Green, to walk the streets that Emma would have walked, to walk through the Carlyle House and get a sense of like "Good lord, my character lived in this house!" I could tell it was very powerful for her. Audrey Davis of Alexandria's Black History Museum poses with L. Scott Caldwell. Hannah James, Tara Summers, and Mary Elizabeth Winstead visit Alexandria. 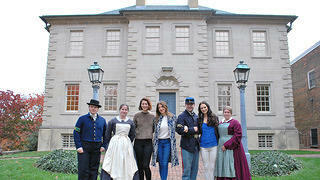 Mary Elizabeth Winstead, Tara Summers, and Hannah James visit Carlyle House. Alexandria—most frequently associated with its colonial history—has embraced the show with the introduction of Civil War tours and new exhibits about this era. What has that been like for the creators and producers? I have to say that’s probably been one of the most exciting things that has happened to us as a creative team. We’ve been living in our bubble, making our series, not understanding the impact that it could have on real people and real communities. The whole tourism approach is now all about the Civil War. It’s tremendously exciting—I would say the most exciting thing that has happened to us through the four years of developing and making this series. Learn more about “Mercy Street” and stay tuned for more articles diving into the fact behind the fiction.